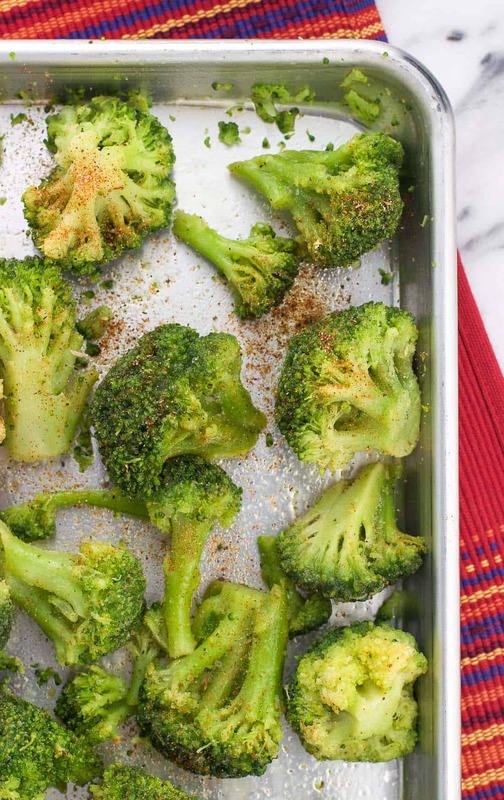 Garlic roasted broccoli with cajun spices is a healthy side dish made even easier by using frozen broccoli. 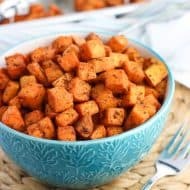 There’s no need for thawing in this simple and spiced up side dish! Recently my husband and I discovered a Cajun restaurant sort of near where we live. Doable for a trip every now and then, but not the kind of place you can easily hit up every week for a meal. But we were in the area and hopelessly indecisive in choosing a dining room chair design, so we had to take a time-out from furniture shopping to get something to eat. Because that’s how it works, right? A full stomach calms the brain? At least that seems to be true in my house. Anyway, we happened upon said hole in the wall place and proceeded to get our minds blown away by how good the food was. Good thing it’s not close to our house because that would be d-a-n-g-e-r-o-u-s. Since, let’s face it – broccoli isn’t the most exciting food to eat, I thought it could do with a punch of extra seasoning to liven it up a bit. 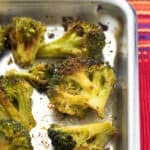 While I’m not claiming for this cajun garlic roasted broccoli to be authentic cajun fare by any means, the spice blend features prominent cajun seasonings like garlic, salt, onion, paprika, and cayenne. Ground pepper and oregano round out the mix for a bold and slightly spicy flavor. Cajun-ish. The beauty of making a DIY spice blend instead of buying a pre-mixed variety from the store is that you are in complete control of the ingredients. For instance, you can add as much/little of the salt as you like. You can also make sure that it’s MSG -free, which sometimes can hide in commercial spice blends. 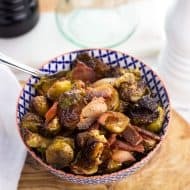 I added ‘garlic’ to the recipe title here as it’s the most prominent spice in this seasoning mix and certainly shines through in the roasted broccoli, but feel free to adjust the spice quantities as you see fit. One of the best parts of this cajun garlic roasted broccoli is that it’s made using frozen broccoli. 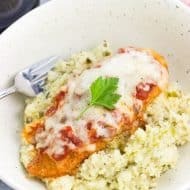 No need for thawing – it goes right from freezer to oven. You can buy a head of broccoli and cut the florets yourself if you like, but using frozen is an easy shortcut that often can be more cost-effective than buying fresh produce. The broccoli you see here came from a 2-lb frozen bag which cost $1.95. Right now broccoli crowns are $1.69 per pound by me, making frozen a better deal with less prep work! Cooking this cajun garlic roasted broccoli at a relatively high temperature (425°F) helps make sure it gets those semi-charred bits that catapult it lightyears ahead of plain old steamed broccoli. Another thing that helps is to generously brush olive oil on the baking sheet, so the undersides of the florets roast up beautifully. My usual MO when roasting vegetables like these spiced oven roasted sweet potatoes is to flip them over halfway through the cook time, but I don’t feel the need to do so with this roasted broccoli. Both sides get nice and roasty as they are. I used a two pound bag of frozen broccoli florets, which was enough to fill a roughly 18″ x 13″ aluminum baking sheet (affiliate link) in a single layer. I love these because they’re extra heavy duty and don’t warp whatsoever in the oven. If you don’t have a pan this large, I’d half the recipe or use two separate pans. Placing the broccoli in a single layer is key! I don’t flip the broccoli over midway through the cook time, but you can if you prefer. 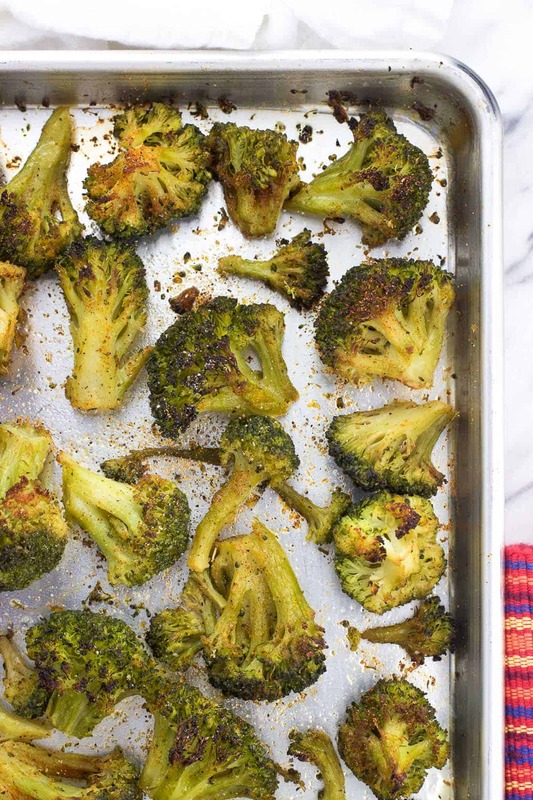 Garlic roasted broccoli with cajun spices is a healthy side dish made even easier by using frozen broccoli. 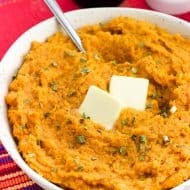 There's no need for thawing in this simple side dish! Preheat oven to 425°F. 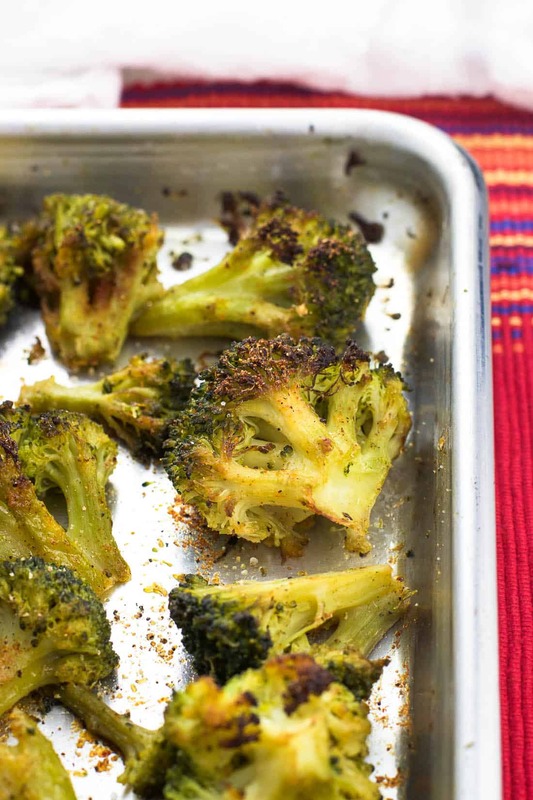 Combine all spice ingredients (everything but the broccoli and olive oil) in a small bowl. Toss broccoli florets in a large bowl with 2 tbsp olive oil. 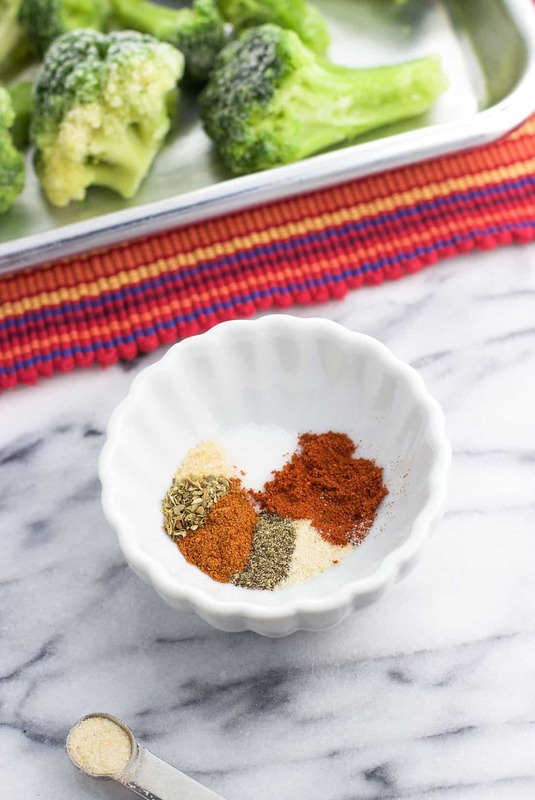 Evenly scatter spice mix over broccoli and toss to combine. Brush olive oil generously on a large rimmed baking sheet. Add broccoli in a single layer to the sheet. Drizzle a little extra olive oil over top. Cook for 35-40 minutes, or until broccoli is roasted to your liking. 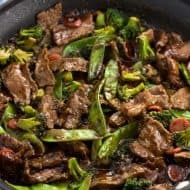 I use frozen broccoli florets for this recipe without thawing. Adjust cook time as needed if using fresh broccoli.